Examples of crepuscular rays are shown in these images, courtesy of Akkana Peck. On Sunday November 2, Daylight Savings Time ends, and evening observing starts an hour earlier. Don’t forget to set your clocks back an hour. Venus is still high in the early evening sky, outshining everything else at magnitude -4.2. On the night of the 30th, Venus and Jupiter stand only two degrees apart, with a three-day old slim crescent moon only seven degrees away. If you have a good western horizon, it might be a good time to dust off that camera. Saturn is a morning object, rising an hour or two after midnight. But if you do stay up for it, check out the rings – they’re only a degree and a half from being edge-on. What an amazing difference from the wide-open rings we saw just a few years ago! I’m looking forward to this Saturn pass. Mercury is visible in the morning in early November, disappearing into the sun’s glare by midmonth. Uranus makes a good target, still sitting in Aquarius, transits about the time the sky gets dark and doesn’t set until after midnight. Neptune, a bubble above the top left of the “champagne glass” of Capricornus, is a more difficult target, running two hours ahead of Uranus and setting a little after 10pm, so if you want to find it, start early in the evening, soon after it gets dark. Pluto rises and sets even earlier, and is too close to the sun to find this month. If you need a Mars fix sooner than that, our neighbor club PAS has been featuring a series of speakers about current Mars missions. Their speaker last month was Brian Day (a past SJAA member, board member and vice president), talking about places on Earth that are good analogues for conditions on the Martian surface. In addition to exotic locales like Antarctica and the high Andes, he showed sites right here in California, like the Desert Studies Center on the dry lakebed at Zzyzx, and the nearby Cima basalt lava fields in Mojave National Preserve. Dave and I visited those Mojave basalt fields last year, and in particular, the same lava tube Brian Day showed in his talk. Mojave is one of the nearest places you can go and explore geologic features similar to those you might see on Mars, the Moon, or Mercury. The lava tube in the Cima lava fields is well marked on the map and accessed off a dirt road. You can walk the trace of the lava tube for several hundred yards, following the occasional collapsed zones (think Schroter’s Valley on the moon – another partially collapsed lava tube you might have seen) and “skylights”, small holes letting you peek down into the tube. But there is one large opening where you can go down into the tube. There’s a rickety ladder chained in place leading down into the tube. 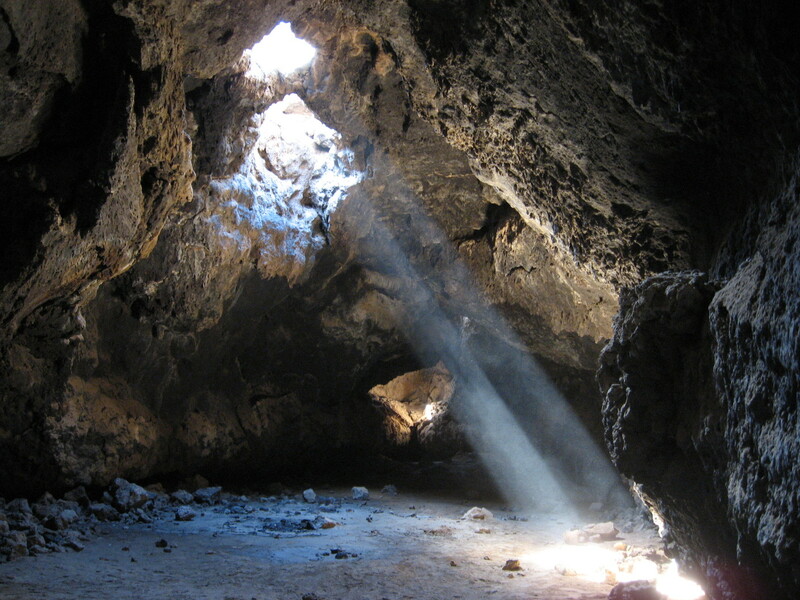 Once down, there are several “rooms” you can explore, most of them already lit with skylights so you don’t need a flashlight like you do for the longer lava tubes of Lassen and the Modoc. But when you’re there, you discover another fascinating effect of the skylights. The floor of the lava tube is covered with fine dust, which gets stirred up as soon as you walk through it. Turn around ... and see the swirling dust create a beam of light coming from the skylight. Brian Day showed a slide showing the same effect. 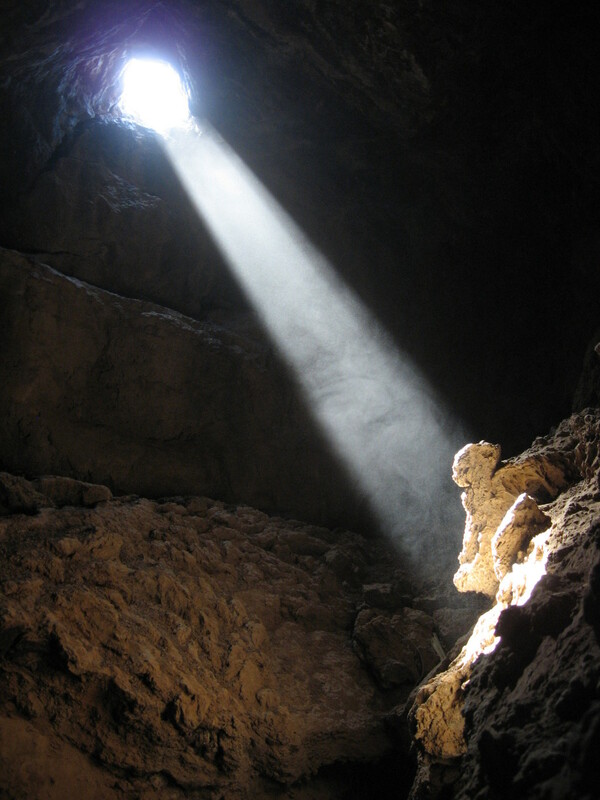 Each room has its own skylight, and thus its own beam of light ...beckoning you to the place where the secret treasure is hidden (Ed. note, see photo on page 6). The secret treasure, in this case, is just the patterned basalt walls and floor of the lava tube ... treasure enough! These beams of light are sometimes called “God rays,” more formally known as “crepuscular rays”. I saw one in a forest above Woodside a few weeks ago. We were climbing a trail that switchbacked its way up a hillside. As we climbed higher and tried to re-find the ray, we discovered an interesting phenomenon:it was invisible when we were standing near it, or looking down it to where we could see it striking the forest floor. The ray was only visible when it was backlit, coming from more or less the same direction as the sun. But that wasn’t true of the rays in the Cima lava tube. And it’s almost exactly the opposite of the effect you see with a green laser used to point out constellations at star parties, where you can only see the laser beam when you’re right next to the laser. Is the difference due to a difference in the size of the dust particles in Mojave vs. the redwood forest vs. Houge park, or simply due to the amount of dust in the air at each place? I haven’t found an answer; more research required. “Crepuscular”, by the way, means something that happens at dawn or dusk. So a “crepuscular ray” is similar in some ways to the sunrise and sunset rays that lunar observers love seeing. Of course, on the moon there’s no dust-filled atmosphere to light up the ray itself; you can only see the places it hits on the lunar surface. Wouldn’t it be marvellous to be able to descend into Schroter’s Valley and see the crepuscular rays caused by stirring up the ancient lunar dust?